ADDIS ABABA, Sep 16 2010 (IPS) - Mesfin Mengistu has been growing trees on his two-hectare farm in Menagesha Woreda for years. “I understand planting trees helps maintain environmental balance, but I do it to earn extra income to cover the rising cost of fertilisers,” Mesfin said. Wheat and maize are his main sources of income from his plot 45 kilometres west of Ethiopia’s capital Addis Ababa. 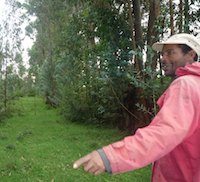 Such care to conserve tree cover has become common in Ethiopia. Deforestation had slashed the country’s forest area from about 35 per cent of its 1.1 million square kilometres surface a century ago, to just three percent by 2000. The country’s agriculture ministry announced in July that forest cover has increased to nine percent as a result of large-scale reforestation campaigns. Ethiopia plants between one and two billion seedlings a year. Environmentalists and government agree that the 80 million-strong population has witnessed an incredible attitude shift during a decade-long reforestation campaign. But observers are sceptical over government’s claim that the country’s forest cover has tripled in the past ten years. The present rate of forest loss has been difficult to estimate for lack of proper data. According to the 2008 Ethiopia Biodiversity and Tropical Forests Assessment by USAID, 146,000 hectares are lost each year. This goes into the balance against the agriculture ministry’s estimate of 650,000 hectares planted with seedlings annually – but these seedlings are yet to become forests. Menagesha Suba, a forest beside Mesfin’s village that has been protected for 500 years, provides seedlings at an affordable price. The Woreda, or district, has this year planted about 18.5 million seedlings through the efforts of individual farmers, farmers’ cooperatives, civil society and government organisations. But not all Ethiopians have this attitude. “Despite an extensive awareness raising discussions, there are still some who cut down old trees, big trees for fuel, charcoal and other purposes,” Garuma told IPS. It is clear that many degraded areas in Ethiopia have recovered in the past two decades. The best examples are found in the Tigray region, followed by Amhara: both northern regions where forests have been depleted by centuries of continuous farming and decades of civil war. Million Belay, director of a civil society group that works on community-based land recovery and biodiversity,.agrees that the dramatic attitude change in recent years has led to an unprecedented level of interest in conserving and expanding forests, but remains pessimistic. The basis for his doubts can be seen in the central, southern and western parts of the country, which host the majority of remaining forests. In the Oromia region, for example,, mature forest cover continues to decline under pressures from a growing population, unsustainable farming techniques, and competition for land. “The status of forest resources should be considered at risk,” the USAID assessment reveals. Despite environmentalists’ warnings, these issues have received little attention from government. USAID’s assessment finds that logging to supply the fuel and timber demands of the country far outweigh reforestation efforts. Laws enacted to control such activities are not properly enforced. These regions are also home to a majority of the country’s livestock, and national parks and conservation areas are not properly protected.